Edinburgh Monarchs raced to their first Premier League away speedway victory of the season, crushing Scunthorpe Scorpions 50-40 at the Eddie Wright Raceway. The Capital side, who are defending their championship title, collected all four match points, and while their hosts have not started 2015 in top gear, this comfortable victory will send a message to Monarchs’ rivals that they don’t intend to loosen their grip on the crown without a strong fight. The match really turned in Monarchs’ favour in the second half in which they won four of the last five heats after the scores were tied 30-30 following ten races. 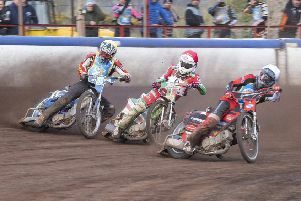 Scunthorpe clearly fancied their chances of avenging Friday’s 53-39 reverse at Armadale, especially as their Australian ace Alex Davies was the top home rider by a mile as he piled up 15 points from six outings which included three race victories. It was another big pay day for Monarchs’ German racer Kevin Wolbert, however. He notched up a trio of wins on his way to a splendid 14 points. He scored 15 points in the first meeting, and he is clearly getting into his stride and underlining how happy he is to have returned to the Monarchs fold after a miserable year at Glasgow Tigers last season. Team-mates Sam Masters and Craig Cook also performed with great credit, but perhaps it was the performance of Rob Branford at reserve that proved the catalyst for Monarchs’ victory. Branford picked up valuable third-place points in heats 11 and 12 which allowed Monarchs to score a brace of 4-2 advantages to open up a four point lead, 38-34 as the match entered a critical phase. And the young Australian was on the money again in the penultimate heat when he followed partner Justin Sedgmen home for a 5-1 which nailed the spoils for Monarchs, who were the only side to win at Scunthorpe in 2014 in the league. Branford admitted it wasn’t his best meeting, but said the whole team pulled together. The Scorpions, however, lacked sting around their own track. Apart from Davies nobody else hit double figures and this certainly was a negative for them. Scunthorpe and Monarchs used the rider replacement facility to cover for injured stars David Howe and Erik Riss respectively. And Scunthorpe gained the most with seven points against four for the Monarchs. Scunthorpe: Davies 15, Auty 8, Wilkinson 6, Pijper 6, Lunna 4, Williamson 1. Monarchs: Wolbert 14, Cook 12, Masters 9, Branford 6, Sedgmen 6, Clegg 3.